The Imagination Station Children's Garden at Henson Robinson Zoo recently welcomed some new garden helpers…WORMS! University of Illinois Extension Logan-Menard-Sangamon Master Gardener and Master Naturalist volunteers added the worm bin to the garden on June 10. The worm bin houses red wigglers. These worms are known as surface feeders and live in depths from 6 to 18 inches which is why they survive and even thrive in confined spaces such as a worm bin. The red wigglers are busy eating food vegetable and fruit scraps and making "black gold", a rich form of compost, that will put on plants to help them get the nutrients they need to grow. 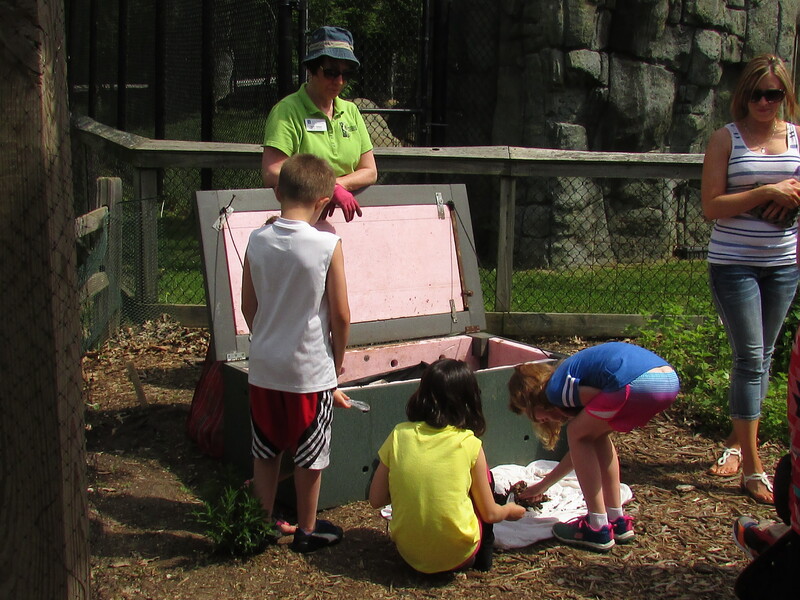 The worm bin has proven to be a huge attraction to visiting families at the zoo! As the children dig in the bin they are learning about how the worms help to increase air and water in the soil and break down organic matter into things that plants can use. Master Gardener and Master Naturalist volunteers love the new garden helpers! If you would like more information about the care and feeding of worms visit University of Illinois Extension, The Adventures of Herman the Worm website at http://extension.illinois.edu/worms/ . For information on how to build a worm bin and compost bin patterns visit University of Illinois Extension Logan-Menard-Sangamon compost demonstration website at http://web.extension.illinois.edu/lms/smmg/3654.html . Henson Robinson Zoo is located at 1100 East Lake Shore Drive, Springfield. For hours visit their website at http://www.springfieldparks.org/facilities/hensonrobinsonzoo/ .